Hardly anyone is born with a perfect smile. If they are, we haven’t met them, and we look at teeth all the time! If you have stains, chips, cracks, or gaps in your teeth that make you feel self-conscious, our cosmetic treatments can easily make them a thing of the past. Our team will work with you to formulate a treatment plan to give you the smile you’ve always wanted, and you’ll be amazed at how big of a difference it’ll make for your self-confidence. Veneers are extremely thin ceramic coverings that are bonded to the front of the teeth, and you can get one or an entire set in as little as two visits. They are completely custom-made, so whether you’re looking for a minor touch-up or a complete makeover, they can give it to you. 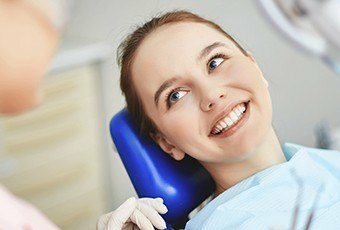 At our practice, we consider the appearance of your smile with everything we do, so when you come to see us to have a tooth repaired, we’ll do it in such a way that not only will your smile be strong again, but beautiful as well. If one of the teeth that shows when you smile has been damaged, we can use an all-porcelain dental crown to fix it. Dental porcelain can be shaped and shaded to blend in perfectly with your natural smile, and even better, we can give you one in just one visit thanks to CEREC. 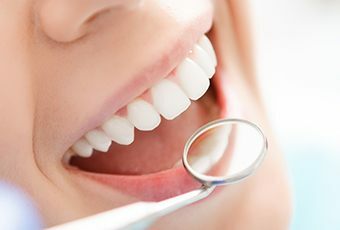 We also use tooth-colored fillings as opposed to traditional amalgam ones to repair small cavities and slightly damaged teeth. They’re made of a malleable and durable composite resin that can be colored to match your other teeth exactly. Whether you need a tooth repaired or you simply want to replace your old fillings with something more subtle, the end result is always a nearly invisible treatment that enhances your smile. And, for minor chips and cracks, we can use a treatment called direct bonding. For this, your dentist will apply composite resin directly to your tooth and use it to sculpt away any and all imperfections. This service takes less than an hour, and the results will blend in seamlessly with the rest of your smile. With ZOOM! Teeth Whitening, we can break up and eliminate deep stains and make your smile look up to 8 shades brighter in as little as 45 minutes. The process will start with us applying a protective barrier to your lips gums, and then we’ll apply a powerful bleaching gel to your teeth. Then, in order to activate it, we’ll use a specialized UV light. This heats up the gel and helps it fight stains even faster. After about 15 minutes, we’ll wipe the gel off and repeat the process until we reach your desired level of whiteness. If you would like to whiten your smile in the comfort of your own home, we can provide you with your own custom-made kit. Our kit will include a set of mouth trays specifically designed to fit your teeth and a bleaching gel much stronger than anything you can pick up at the store. 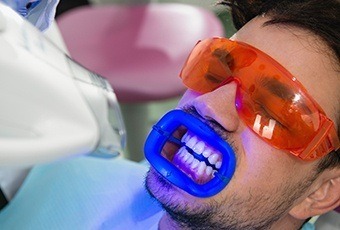 All you’ll need to do is wear the trays with the gel for about 30 minutes a day for 2 weeks to see the complete result. The best part about this treatment? You can use it whenever you need a touch-up, assuring that your smile will always be shining! Do you have a smile that shows a little too much gum tissue? Would it be fair to say that you have a “gummy” smile? Do your teeth appear too short or stubby? The perfect smile shows just the right proportion of lips, teeth, and gums, and sometimes, the gums can interfere with this. Luckily, our doctors can use a soft tissue laser to painlessly remove excess gum tissue to expose more of your natural teeth. The end result will be a gorgeous smile with just the right balance. 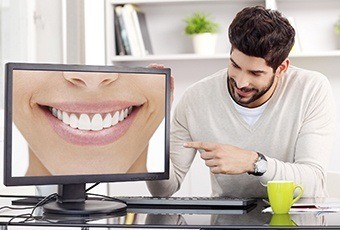 We know that doing anything that could alter the appearance of your smile is a big decision, so to make things easier, we can use our Virtual Smile Design system to show you your results before we begin treatment. 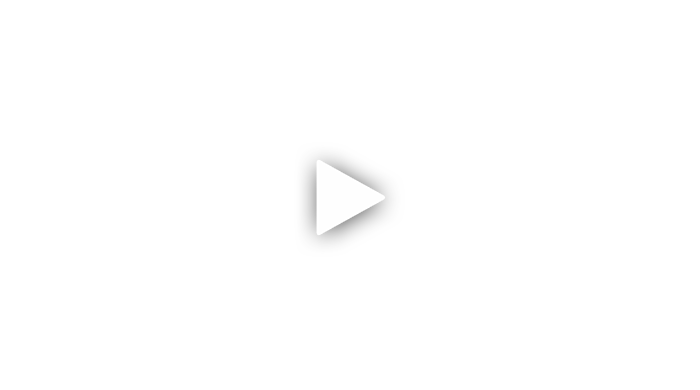 Basically, we can create your own “before and after” pictures using current images of your smile and our own in-house software. With this, you can get a much clearer idea of what to expect with a certain procedure. Plus, this will also give you a chance to ask for any slight adjustments so we can be sure we’re giving you the exact smile you want. Cosmetic dentistry is no longer just for celebrities and the exceedingly rich. Now, anyone can get the smile of their dreams and enjoy the renewed sense of confidence and well-being that it brings. To schedule a cosmetic consultation, contact us today. We’re happy to serve patients from Ripon, Markesan, Green Lake, Princeton, Oshkosh, Berlin, Omro, Winneconne, Fond du Lac, Wautoma, Waupun, and beyond!